Last week we were very happy to be exporting our very first set of forklift sweeper brushes into Europe! The metal recycling company recently contacted us wanting 3 of our heavy duty FLB23plus brush units. 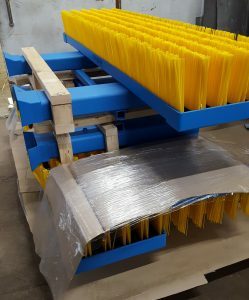 At 2.3mtrs each with extended fork-sleeves and some serious weight, we had an interesting learning curve in logistics to ensure our ready assembled brushes made it to their EU destination unscathed. Widdops have been exporting our standard brush strip and rollers across the world for some years now and are happy to quote any products to include shipping and any appropriate taxes.